So much for staying caught up! Let’s just ignore the fact that I haven’t posted in months, shall we? Anyway, I wanted to post about my husband’s birthday earlier this year. There are two reasons why: 1) I made the most amazing, most epic, most legen-(wait-for-it)-dary birthday cake ever, and 2) I tried my hand at reupholstering a chair. Now about that chair. It is an office chair. 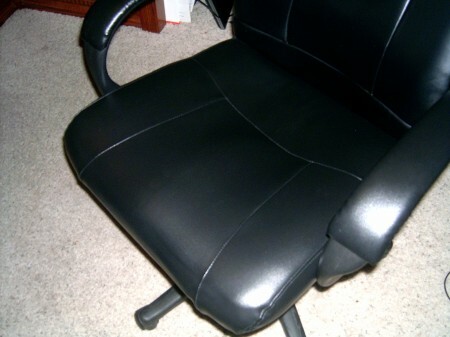 My husband’s favorite office chair, and despite continued use for several years, it is still in relatively good condition. The only problem was that the seat and arms had gotten pretty scuffed up. I figured I could by him a new one, but good chairs aren’t cheap, and finding one that fits a 6’7″ tall man comfortably can be a bit of a challenge. So I decided to try to fix the old one. If I failed miserably we could go chair-shopping, and if I succeeded we could put that money toward a new tablet. Hubby loves his new tablet. My plan was to fix the chair after work while my husband was at his job and not say a word. That way, he’d eventually sit in the chair, discover the transformation, and be happily surprised. I planned for everything: bought the material in advance and looked up tips on sewing vinyl, located the screw gun and stapler in the garage, tested a couple screws on the chair to know that I could actually unscrew them. Thus since the sewing part didn’t take too long, my plan would have totally worked!… except for the fact that I apparently tested the wrong screws, as I couldn’t completely unscrew the arms from the chair. So I did get caught mid seat-stapling, but it was still an awesome surprise for the hubster nonetheless. Unfortunately I am still not in the habit of taking pictures of my projects, so I didn’t get a before picture of the poor chair. But I did remember this fact and get a pic while in the process. 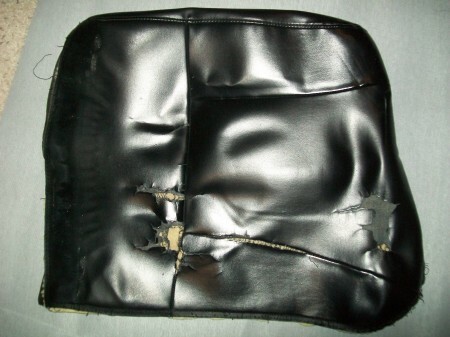 Here is the chair’s seat after being detached from said chair. It has apparently seen better days, but what can you expect from something that gets sat on repeatedly for a living? As you can see, the seat was not in the greatest shape. The arms were not any better, as they often got scratched along the lip of the desk. So a makeover was definitely in order, and it was actually pretty easy. I just took apart the seat pieces at the stitches to use as a pattern, cut out the new vinyl, and sewed it together. I didn’t have any issues with the material sticking to the foot of my sewing machine since I used a type with a fabric backing, though in my research I found that simply sticking clear tape to the foot would solve this problem. I added a new piece of foam to make the seat a little cushier, and stapled the cover around it on the back. I found the material was a little difficult to stretch and the wood backing was pretty hard to staple into, so I’d suggest if you try something similar to make your pattern a bit longer along the edges. Having an extra pair of hands would certainly help, too, if you’re not trying to be stealthy like me! So Hubby helped me disengage the arms from the chair and I got them recovered, as well. So now the office chair looks as good as new! But that’s not why you’re reading this, is it? You’re here because you want to know about the birthday cake of amazingness and chocolate on top of chocolate with cheesecake and Oreo crust. Read on. The original cake recipe is NOT mine. 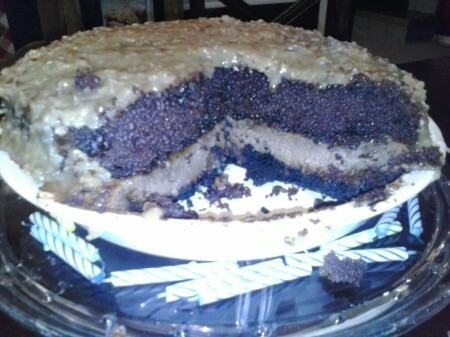 I found it on Pinterest as I was looking for supped-up versions of German Chocolate Cake (a husband favorite). There a couple other good contenders, such as this one and these brownies/bars, but this recipe for German Chocolate Cheesecake by Julie from Willow Bird Baking takes the cake. Literally. This picture was taken with my phone, and does not do this legendary cake justice. Please don’t judge this cake by this picture alone. This cake is not a lie! Now when I made this cake, I wanted to spend more time birthday-celebrating than cooking, so I took a few shortcuts. Instead of making the cake portion from scratch, I used a Devil’s Food cake mix. And for the filling I used a premixed container of Coconut Pecan icing. I’m sure following the recipe to an exact science would make this cake even better, but my version was still nearly mind-blowing, and I would hate to lose my head completely. I also didn’t have a springform pan, though I now know why on earth I need one. So when I made the Cheesecake portion I baked it in a pie dish and then place a Cake halve on top. Now this method of using a purchased cake mix yielded twice as much cake as needed, and I simply can’t just waste cake. So I ended up actually making two of these amazing cheesecake cakes. This first cake I made as a German Chocolate Cheesecake as her recipe states (just with the couple substitutes). For the second cake, I was out of the pecan icing, so I used Chocolate Fudge icing. This second, chocolate on chocolate, cake didn’t have as much Oreo crust or Chocolate Ganache as the German chocolate version, but it was still epically good. So good, in fact, that my husband took this cake to work the next night to celebrate with his coworkers. There were only five or so of them working that night, yet the entire cake vanished. And my husband didn’t even get a slice! This chocolate version of the cake was so good, so gosh-darn-chocolately-cheescakey-get-in-my-mouth-right-now good, that people at my husband’s workplace STILL TALK ABOUT IT. And it has been seven months since his birthday. So I greatly recommend trying this mouth-watering, rich, never has there been so much chocolate in one bite, cheesecake full of goodness cake before you die. Or don’t. Because this cake is so amazing, it just might ruin all other cakes for you for the rest of your life. Let this be a warning; this cake is good.